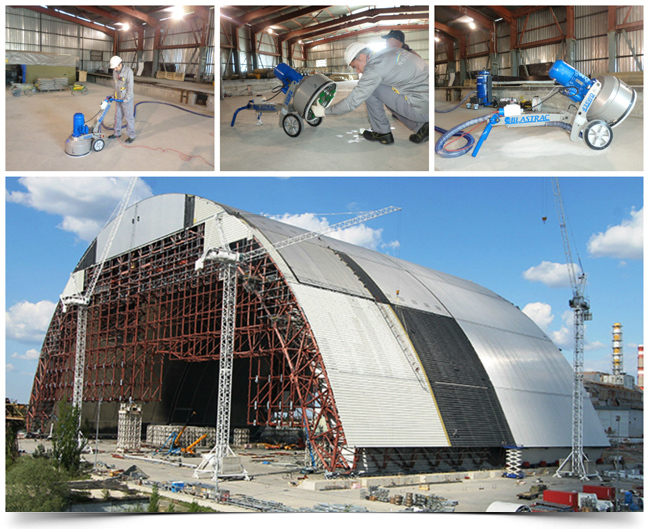 The Company NOVARKA is actively building a new sarcophagus over the destroyed nuclear reactor at Chernobyl nuclear plant. This unique construction will look like a huge arch. Its length is 257 meters, width - 162 meters, height - 108 meters. The new confinement is designed to last for 100 years of safe operation. In September 2015 the company NOVARKA signed a contract with Blastrac Ukraine for the supply of the following equipment for work starting on the 1st October on the new sarcophagus : triple head grinding machine Blastrac BMG-435W and dust collector Blastrac BDC-1330. Considering the importance and specification of the project our experts quickly and efficiently trained operators and helped to choose the right toughness and grit compounds of the grinding segments.